ILoveBees redirects here. For the blog, see I Love Bees (Blog). For the website, see I Love Bees (Website). i love bees is an alternate reality game developed by 4orty2wo Entertainment used for the marketing of Halo 2. During the summer of 2004, the website www.ilovebees.com was used as a publicity site for Halo 2, with the site being pointed to by an advertisement for the game played alongside movie trailers. Ostensibly a beekeeper's personal site, the server appeared to have been taken over by an unstable AI whose thoughts were found scattered on the site. Players would interact with this AI and help her return to the future and save the world from the Halo Array. 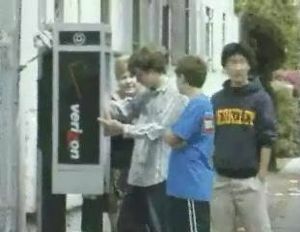 Players wait at a payphone. On July 23, 2004, Halo fans saw a flickering URL in the Halo 2 Cinematic Trailer that led them to a website that appeared at first glance to be hacked. A message on the frontpage directed viewers to the blog of a girl named Dana Awbrey. Dana claimed that she built the ilovebees site for her Aunt Margaret and recently her site got in this bizarre state and asks if anyone could help her. Dana more or less acted as a narrator in the game, describing events for people who missed the action. The frontpage had a counter counting down to July 27, 2004 (when "network throttling [would] erode"), August 10, 2004 (when "this medium [would] metastasize"), and August 24, 2004 (at 8:06 A.M., when it would be "wide-awake and physical") By the end of the game, there was a counter counting down to the day the Covenant will attack Earth. The website fell off the Internet in 2015. On August 10, a list of GPS coordinates with times were added to the site's Links page, along with a countdown to "Axons go hot." With the exception of one leading to the Pacific Ocean, all of the coordinates led to payphones. On August 24, the countdown ended as it reached the first set time. People who answered the payphones (the "axons") at the scheduled times spoke to a recording of the AI and were asked basic questions about the character. If answered correctly, an audio clip would be released and a number would be added to a counter on the Website. The audio clips, when threaded together, formed an audio drama about characters in the Halo universe. As the number reached 777, the AI, now played by a voice actor instead of a recording, began interacting with players through the payphones. The AI would ask for their name, rank, and proof that they were human. Players would provide their usernames, choose ranks, and improvise proof (e.g. joking, singing). Their names were added to the site, crediting them for activating the axons. After the game was over, players were invited to go on a "training mission," which was actually a chance to play Halo 2 multiplayer before its release. Various sites around America were used to host the event, including movie theaters and malls. Players were told to say the phrase "The Operator left a message for me." to gain access to the event. Unfortunately, several of the hosts were unaware of i love bees and thought it was just a Halo 2 event, disappointing many fans. At each event, players were given DVDs containing all of the i love bees audio files, as well as deleted material and screenshots from the site. In 2552 an alien artifact splits up the UNSC AI Melissa into three parts. One part stays in 2552, has amnesia and is named Durga. The other two parts, the Operator and the Sleeping Princess, are sent back in time to the website "I Love Bees". Also with the latter is a Trojan Horse AI ("The Seeker") sent by the Covenant as a spy. The Operator falsely believes the Sleeping Princess is the Trojan Horse, and tries to kill her. Participants in the ARG would communicate with the Operator and the Sleeping Princess to learn details of the plot, forming different factions for either character. Players allied with the Operator were required to go to certain payphones at certain times to answer calls from the character. Persons who answered the calls needed to show they were part of the game by answering basic questions (e.g. “What's my name?”), after which parts of an audio drama were made available on the site. Later calls were performed by a voice actor playing the Operator, with whom players engaged in role play. The audio drama consists of recordings taken by Durga in 2552, explaining what's going on in the future. Durga is taken in by a boy named Jersey, who realizes he has “God's own spyware” and uses her to spy on the hot girl in the building, Jan. In doing so, it comes to light that her family is a lot more interesting than first apparent. Durga goes on to spy on several other people she finds interesting and eventually assembles them into her “crew”. She takes her crew to a military base to deactivate the alien artifact, which will potentially keep the Halo Array from activating, and the action causes the AI fragments to return to the future and merge back together into Melissa. It seems like everyone will live happily ever, but then the Covenant invade Earth as Halo 2 begins. This was shown in the graphic novel as two characters from i love bees, Herzog and Standish as well as events in the i love bees storyline in which they took place, are referenced in a canon image. Additionally, entities introduced in i love bees, including Optican, chatters, and communications kiosks, were later featured in Halo 3: ODST. The colony Mamore was mentioned prominently in promotional material for Halo: Reach. Finally, several key elements of i love bees, including Melissa, the UNSC Apocalypso,and the deep-space artifact are included in the officially canon Halo Encyclopedia, retconning previously existing canon to some degree. In 2011, Frank O'Connor again stated that i love bees is considered canon by 343 Industries. Still, i love bees cannot be considered entirely canonical. Some elements of i love bees directly contradict more recent material of definite canon status, such as the time in which Tobias Fleming Shaw and Wallace Fujikawa were alive. Thus, i love bees could be considered canonical unless contradicted by more authoritative sources. Players in the game referred to themselves as "beekeepers". Soon after i love bees became popular, someone bought the domain name www.ilovepees.com and auctioned it on eBay. The person claimed that whoever made it a redirect to their own site would receive a large amount of search traffic from players who typed the address incorrectly. A player tried to answer a live call in the middle of Hurricane Ivan. The staff member in charge of calls (Puppetmaster 2) broke character to tell him to run to safety: "Dude, it's a hurricane. Put the phone down." Yuri Lowenthal, voice of Kamal Zaman, is also the voice of the Prince in the Prince of Persia series, and Sasuke in the Naruto series. A piece of Kamal's dialog, "People think time is a river that flows in one direction, but time is an ocean." seems to be a deliberate reference to the Prince's "Some say time is like a river that flows swift and sure in one direction, but I have seen the face of time and I can tell you they are wrong. Time is an ocean in a storm." In the website's source code, the following search engine keywords were included: "honey, bees, Margaret, small busines, beekeeping, hives, retail, market, Operator, bug, buggy, virus, infestation, WTF is going on with this damn thing, parasite, strong intrusive inclination, medium, messages, shipwreck, network throttling, SOS, hoax, game, bee hoax, bee game, survivor, survive, evade, resist, escape, a little help would be appreciated, thanks and tip your waitress, sleep, is, good, install, reinstall, re-reinstall, re-re-reinstall, I, love, bees". Though in-universe Dana put them in for her own amusement, some of the keywords explain that it is a work of fiction, such as "bee hoax". i love bees DVD menu. i love bees players sneaked a banner for their i love bees team into a real life political event. ↑ halo.bungie.org: Bees... you think Ant Farm was involved? ↑ halo.bungie.org: How Stupid ARE People, Anyway? First and second Slashdot articles. G4 show on the game - WMV file.